Punjab ITI Admission 2018 :- Punjab ITI Registration 2018 Start Date, Apply Online Punjab ITI Application Form 2018 Last Date at Official Website of itipunjab.nic.in. 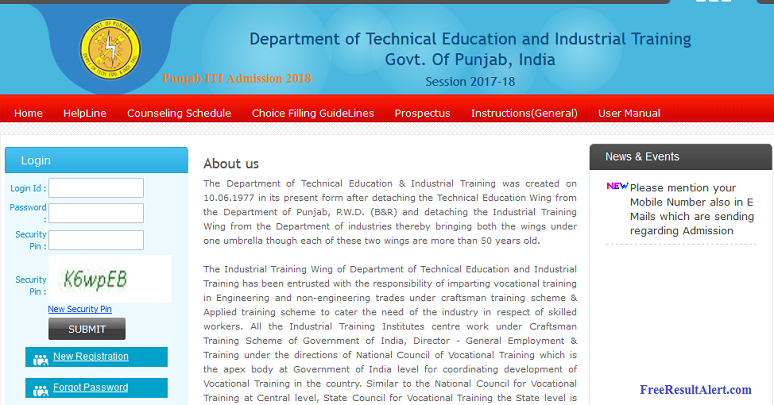 Department of Technical Education & Industrial Training Institute has released Punjab ITI admission forms. In this students will get the chance to Apply Industrial Training Institute Punjab Registration 2018 for engineering and non-engineering courses. Students who want to take admission into this will have to go for Punjab ITI Registration 2018. Interested candidates can apply under the given timeline. Students who will fill Punjab ITI Admission 2018 Online Form will get the chance to get admission from one of 172 ITI institutions of Punjab. Important Note:- After filling ITI Admission Form, take the printout of filled application form to nearest DI with the person who applied for admission for document verification. It is mandatory else the application will be discarded. In this process, eligible candidates will have to register first. The Online ITI Admission 2018 Punjab Registration will start from 1st June 2018 to 26th June 2018. In this 85% seats will be allotted to Punjab resident candidates and rest 15% Seats will be applicable for other states candidates. Punjab ITI Admission 2018 and shortlisting will be done on eligibility basis. Students will be shortlisted first by their Punjab ITI 2018 Online Admission Form and then they will go for next rounds. For engineering Course – In this ITI Punjab Recruitment 2018 12th qualification is required in Maths and Science. For Carpenter, Mason (Building Constructor), Mechanic (Tractor) , Foundry Man Technician, Mechanic Agricultural Machinery, Welder, Wireman and Welder (GMAW & GTAW) engineering trades Painter General, Plumber, the candidate must be 8th class qualified. For Non-engineering Course– Also, For this field, a candidate must have Passed HSC or 10th class. Also, For Old Age Care Courses and Sewing, Technology Candidate should be 8th class passed. Note :- For any query contact our team via comment medium below and our team will revert you back soon. First of all, students will have to reach the official portal i.e. www.itipunjab.nic.in. There, look the Right Side, at Choose the “Admission Open” option. Then, Find & Select the “Punjab ITI Admission 2018” Option. Done!! Start Filling all the Required Details & Also Make the Payment. How can i get admission for a.c. refrigration mechanic ???? ?